Two weeks ago, British television production company Sky TV canceled an episode of its new Urban Myths series. The “tongue-in-cheek” show explores history’s most outlandish — and unverified — mysteries. The episode in question, titled Elizabeth, Michael & Marlon, was to feature the story of Michael Jackson, Elizabeth Taylor, and Marlon Brando’s post-9/11 road trip out of New York City. The show, originally scheduled to air this year, was riddled with controversy from the moment white English actor Joseph Fiennes (American Horror Story, Shakespeare in Love) was cast to play Jackson. On the surface, it’s ridiculous and downright offensive to have a white British actor play one of the most popular African-American figures in the world. Jackson was a central figure in the black community, from being a Motown pioneer to his charitable efforts that spanned the entire continent of Africa. For a white man, born thousands of miles away, across the pond, and likely shielded from the plight of blacks in America, to play such a revered black musician as Jackson is a slap in the face to all the hard work by Jackson and countless others.. But, as with most things surrounding the late King of Pop, it’s not that black and white. While Jackson was no doubt a black man, no matter his skin color, the casting of Fiennes to play Jackson in his later years isn’t as controversial as it appears. In fact, it makes sense. Sometime in the early 1980s, Jackson was diagnosed with vitiligo, a pigment-altering disease that created colorless blotches across his body. Between 1983’s Thriller and 1987’s Bad albums, Jackson’s skin became visibly lighter, almost beyond recognition. By the time of 1991’s Dangerous, Jackson no longer resembled the tween lead singer of the Jackson 5 or the handsome, tuxedo-clad gentleman on the cover of 1979’s Off The Wall. Rumors circulated for years that Jackson lightened his skin in order to “look white,” but after the singer’s death in 2009, autopsy reports confirmed that he had spots of skin that were both light and dark and was taking FDA-approved medicine to treat vitiligo. Nonetheless, between 1983-2009, Jackson drastically altered his appearance to the point that he looked more like a white man from Hollywood than a black kid from Gary, Indiana. This doesn’t automatically disqualify black actors from portraying the singer in TV and films, but it does complicate casting in a way it wouldn’t for, say, Whitney Houston or Nelson Mandela or Martin Luther King Jr. In recent weeks, many media outlets, including Essence, have pointed to an 1993 interview Jackson gave to Oprah Winfrey as proof that Jackson would never want a white actor to play him. Winfrey asked the singer about a rumor that he would prefer a white child to play a younger version of him in a Pepsi commercial. Jackson shot back, “Why would I want a white child to play me? I’m a black American. I’m proud to be a black American. I am proud of my race. I am proud of who I am.” But the question was specifically about Jackson as a child, when his skin color was darker than it was at the time of the Winfrey interview. Jackson’s impassioned response also appeared to be a direct denial of a ’90s rumor that he no longer wanted to be black. Which brings us to Jackson’s own children. Throughout his life, Jackson was publicly and romantically linked to a handful of women — from Brooke Shields to Stephanie Mills to Tatum O’Neal — most of whom were apparently white. After his 1996 divorce from Lisa Marie Presley, Jackson married former nurse Debbie Rowe that same year for the sole purpose of procreation. According to friends of Jackson, the singer wanted children with blond hair and blue eyes, traits rare in African-Americans. According to former publicist Bob Jones, Jackson would even refer to black children as “splaboos,” which can only be interpreted as an insult. Jones was fired by Jackson in 2004 and testified for the prosecution in the latter’s 2005 sexual abuse case. Jackson’s representatives “refuted Jones’ allegations, saying that they were untrue.” They noted also that “Jones has supported Jackson in the past and suggested he has changed his story to sell his new book.” That being said, Jackson’s children, Prince Michael, Paris and Blanket, all have physical features that mirror full-blooded whites, adding to the rumor that none are the biological children of Jackson. This doesn’t automatically disqualify black actors from portraying the singer, but it does complicate casting in way it wouldn’t for Whitney Houston or Nelson Mandela. There has never been confirmation that Jackson used a white sperm donor, but, based on his appearance in 1997, when Prince Michael was born, it might make sense that Jackson would want his children to resemble his current complexion, which was closer to white than black. In the event of a movie depicting the three children, it stands to reason that Prince Michael, Paris and Blanket would be portrayed by three white actors, despite their father being African-American. There are complications with having a black actor play a white or much lighter-skinned character. Shawn and Marlon Wayans donned horrendous prosthetic latex face masks, blond wigs and blue contact lenses to play knockoff Hilton sisters in 2004’s critically panned cult classic White Chicks. Aside from the movie flopping, the Wayans, in whiteface, looked more bloated Claymation than actual human beings. A month after White Chicks’ release, VH1 broadcast Man in the Mirror: The Michael Jackson Story, starring Flex Alexander, who is dark-skinned, as Jackson. The makeup department applied heavy white makeup, face powder and a lace front wig to Alexander — the final product paralleled Wednesday, the daughter from The Addams Family. Actor/comedian Tommy Davidson hilariously parodied Jackson’s “Black or White” song for Mad TV, and faced similar makeup problems as Alexander and the Wayans. Yet, outside of aesthetics — and make no mistake, a light-skinned black actor or an actor with vitiligo should’ve been considered for casting as well — there are deeper reasons to object to Fiennes playing Jackson. Hollywood has a deep, troublesome history of either stereotyping black characters or completely erasing them.. This is why it took more than 50 years for the story of mathematicians Katherine G. Johnson, Dorothy Vaughan and Mary Jackson to make it to the big screen in Hidden Figures, while prominent civil rights activist Rob Schneider made two Deuce Bigalow movies in less than a decade. From the 19th century origins of blackface and minstrel shows that exaggerated the stereotypical mannerisms of blacks, the television and film industry has a much documented and disturbing track record with regard to diversity. The early days of the many Uncle Tom’s Cabin adaptations, the Amos ’n’ Andy radio and television series, and the original The Birth of a Nation inevitably led to black- and brownface performances from Robert Downey Jr. in 2008’s Tropic Thunder and Al Pacino in 1983’s Scarface, who were nominated for an Academy Award and Golden Globe, respectively. When African-Americans or other people of color aren’t directly stereotyped or typecast — in entertainment, they’re intentionally ignored. Jackson’s impassioned response also appeared to be a direct denial of a ’90s rumor that he no longer wanted to be black. Kerry Washington as Olivia Pope in Scandal was the first black female lead on a network drama in almost 40 years. Tracee Ellis Ross’ recent Golden Globe Award for best actress in a comedy was the first for a black woman since 1982. White actors have controversially played nonwhite main characters in recent films such as Aloha, The Last Samurai, The Great Wall, Gods of Egypt, Exodus: Gods and Kings, Prince of Persia: The Sands of Time, and The Lone Ranger. On the flip side, black actors have also played the roles of traditionally white characters, including Nick Fury (Samuel L. Jackson), Cinderella (Brandy Norwood) and Johnny Storm (Michael B. Jordan). Dwayne “The Rock” Johnson has done it at least three times (Walking Tall, Gridiron Gang and Hercules), and the casts of Annie, The Wizard of Oz, and Steel Magnolias have all been remade into black-led films. These castings, though, were intended to make up for centuries of neglect from Hollywood rather than address the issue of diversity in all areas of the entertainment industry. It’s important to keep in mind that Urban Myths is “mischievous and deliberately ambiguous,” not an epic historical recounting of true events. Unlike 1992’s The Jacksons: An American Dream miniseries, and to an extent Man in the Mirror: The Michael Jackson Story or even the upcoming Lifetime biopic based on Jackson’s life, Elizabeth, Michael & Marlon was intended to be lighthearted satire. Getting it “wrong” about Jackson in that context isn’t as unforgivable if it were a serious biopic about the singer’s life. It would be one thing if the upcoming Tupac Shakur biopic All Eyez on Me had Ryan Gosling playing the late rapper, but Fiennes with the prosthetic nose, rosy red cheeks, cleft chin and black fedora favors Jackson, who, toward the end of his life, looked like a cartoon version of his former self. Based solely on looks, Fiennes was about as close as the casting director was going to get to finding a replica of Jackson. … it stands to reason that Prince Michael, Paris and Blanket would be portrayed by three white actors, despite their father being African-American. Given the history of African-Americans in entertainment, it’s uncomfortable to accept yet another white person taking an acting role away from capable black actors, or even accept that Jackson looked terrible near the end of his life. 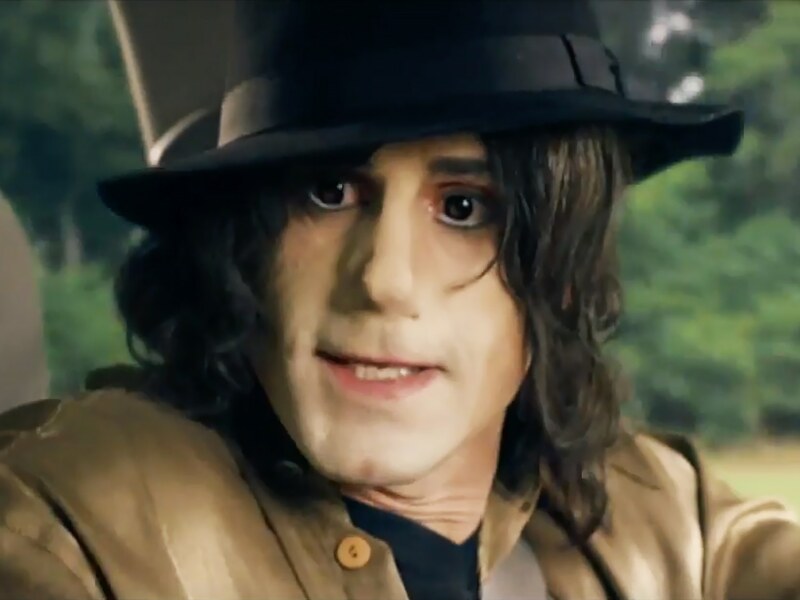 The sting of white actors applying burnt cork to their face to mimic and ridicule blacks can still be felt, no doubt, but in the case of Michael Jackson, we’re in uncommon territory. The King of Pop was the first superstar entertainer to ever completely alter the color of his or her skin, creating a unique set of circumstances with regard to how to celebrate his life’s accomplishments. At the 2014 Billboard Music Awards, a digitally projected hologram of Jackson performed a track from his posthumous Xscape album. The creators could have based the hologram on any of the singer’s various looks: black tuxedo and Afro from Off The Wall, sequined jacket and Jheri curl from Motown 25: Yesterday, Today, Forever, or white glove and aviator sunglasses from the 1994 Grammys. Instead, the Jackson hologram closely resembled post-1990 Jackson, complete with long, straightened hair and a light, olive skin tone. They, in essence, chose the Michael Jackson who resembled a white man.